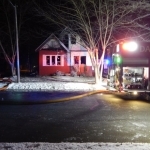 No injuries were reported early Saturday (February 2, 2019) as flames swept through a two-story home in Danville. 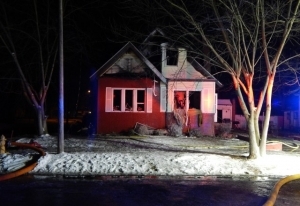 Firefighters responded to the alarm at 1002 North Robinson Street around midnight and were still on the scene five hours later. The brick home was occupied when the fire erupted, but everyone got out safely. Some heavy equipment was brought in to knock down the remains of the structure to help firefighters reach hot spots.